The 2018 Pirelli World Challenge season is the twenty-ninth consecutive year for the championship. There are six race weekends for the Touring Car categories. The title chase kicks-off in March at Circuit of the Americas. This event is followed by races at Virginia International Raceway, Lime Rock Park and the Portland International Raceway. The penultimate rounds are held at the Utah Motorsports Campus with the finale taking place at Watkins Glen International on the Labour Day weekend. As in the previous year, there were three Touring groups; however, there were some significant changes. With dwindling entries in the Touring Car B class, series organizers decided it would not be included in the 2018 championship and was replaced by a new category, TCR. Touring Car (TC) – This class is for smaller sedans and sports cars which are allowed some performance modifications. These front or rear-wheel-drive vehicles may be powered by turbocharged or normally aspirated engines. Examples of cars competing in this category include: Honda Civic Type R, Nissan 370Z, BMW235iR and Genesis Coupe. Touring Car A (TCA) – Some of the cars competing in this class are the same as those found in Touring Car. What sets them apart is the minimum amount of modifications that can be made – most changes are to improve the safety of the vehicles. Using turbocharged or normally aspirated powerplants, these cars produce between 160 and 185-horsepower. Touring Car Race (TCR) – This is an international class which was first introduced in 2014 to address the expense of competing in the World Touring Car Championship. These production-based cars are powered by 2.0-liter turbocharged engines which produce approximately 300-horsepower. Examples of vehicles competing in this category include: Audi RS 3 LMS, Volkswagen Golf GTI TCR, Honda Civic Type-R TCR, Alfa Romeo Giulietta TCR and Hyundai I30 N TCR. For the first time since 2010, the Pirelli World Challenge series made a stop at Watkins Glen International in an event called the PWC Grand Prix of Watkins Glen presented by TM Performance. 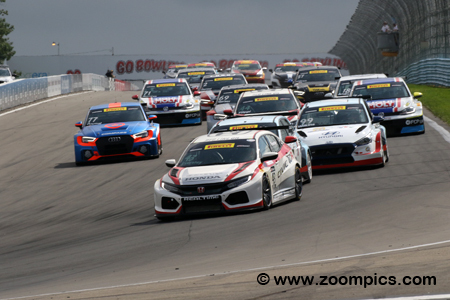 TCA and TCR teams would compete in two forty-minute races around the eleven-turn 3.4-mile road course to determine the 2018 class champions. 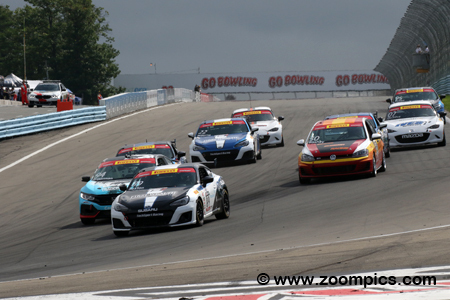 The penultimate race for the Pirelli World Challenge TCR class at Watkins Glen International. 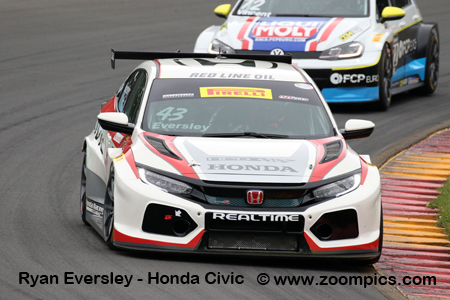 Leading the field of twelve competitors into corner one is the pole-sitter, Ryan Eversley driving the RealTime Racing Honda Civic Type-R TCR. Behind Eversley are the Bryan Herta Autosport Hyundais of the second and third fastest qualifiers, Michael Lewis and Mark Wilkins. 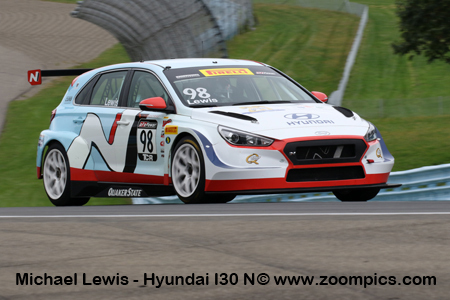 Heading into the final weekend of the 2018 season RealTime Racing’s, Ryan Eversley held a seven-point lead in the TCR standings over Michael Lewis driver of the Bryan Herta Autosport Hyundai i30 N TCR. On Saturday morning, Eversley recorded the fastest qualifying time and led the afternoon contest flag-to-flag after a battle with Lewis. 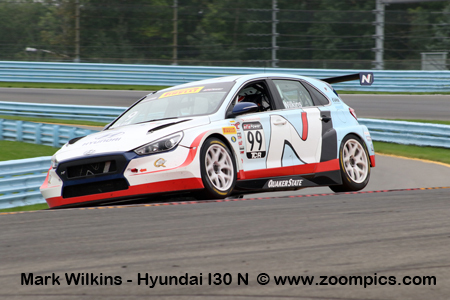 The following day, the Hyundais had problems, allowing him to take the win and championship. Spencer Patterson driving the No. 79 Subaru BRZ tS was third quickest in the Saturday morning qualifying session. In round eleven, Patterson chased Tom O’Gorman in the race leading Honda Civic for seventeen laps and finished second. However, O’Gorman’s Honda failed the technical inspection giving the victory to Patterson. In the season’s finale, Patterson captured the final spot on the class podium. Mason Filippi started the season driving a Volkswagen Golf GTI TCR but switched to RealTime Racing for the final two race weekends. 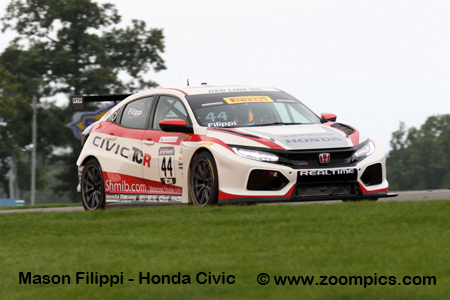 At Watkins Glen International, Filippi had come to terms with the Honda Civic Type-R TCR and had his best results of 2018. On Saturday, he grabbed the final spot on the podium after starting fourth. The following day Filippi went one better and finished behind the winner, Ryan Eversley. Travis Washay entered the first three race weekends of the year but skipped the Portland and Utah rounds. 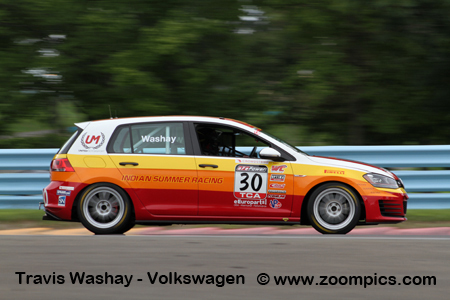 Driving the only Volkswagen Golf GTI in the TCA class, Washay grabbed a runner-up finish at VIR and a third at Lime Rock. During the qualifying at Watkins Glen, he was fifth quickest and inherited a second place finish when O’Gorman was disqualified. Starting from the pole Sunday, Washay captured his first win of 2018. TCA competitors head into Watkins Glen International’s corner one for Saturday’s race. A split start was used with the quicker TCR category receiving the Starter’s flag first followed by the TCA group. 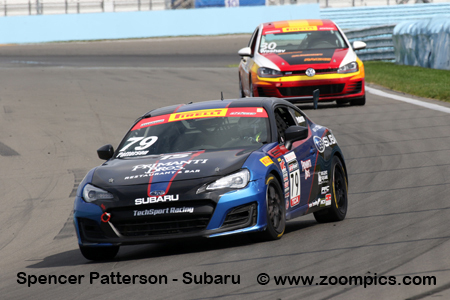 Second fastest qualifier, Jeff Sexton driving the TechSport Racing prepared Subaru BRZ tS won the race to the first turn. Falling in behind Sexton are the pole-sitter, Tom O’Gorman and Sexton’s teammate, Spencer Patterson. 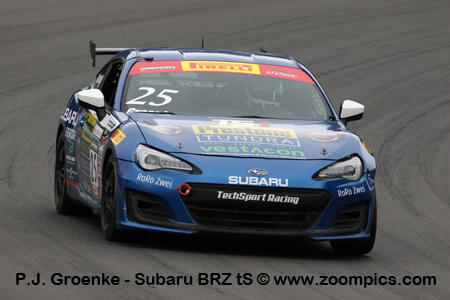 TechSport Racing entered five Subaru BRZ tS’ in the final two rounds at Watkins Glen International. The No. 89 Subaru was raced by Jeff Sexton. 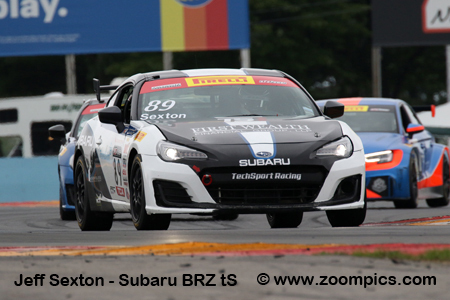 Sexton’s season started slow but by Lime Rock, he finished on the podium and won both events at Portland. In the penultimate race of the 2018 season, he finished fourth and on Sunday he was second – 2.523-seconds behind the winner, Travis Washay. Michael Lewis was second in the standings and had a chance of winning the TCR championship. For the weekend’s first event, Lewis qualified behind, Ryan Eversley and his teammate, Mark Wilkins. In the race, he chased Eversley and finished second by a margin of only 0.221-seconds. Lewis’ quick lap from round eleven gave him the pole the following day. Unfortunately, he experienced issues and was fifth. Entering Watkins Glen, Mark Wilkins was third in the standings and trailed the point’s leader, Ryan Eversley by twenty-five markers. Wilkins had a mathematical chance of securing the title but it would take a miracle. He qualified the Byan Herta Autosport Hyundai i30 N TCR on the outside of the front row for round eleven but finished fourth. In the finale, Wilkins also encountered problems and was finished second last. With the demise of the TCB class the series champion, PJ Groenke joined the TCA ranks. Returning to TechSport Racing, Groenke drove the No. 25 Subaru BRZ tS. He started the season with a pair of third-place finishes at COTA. After this initial success, the team suffered some reliability issues. 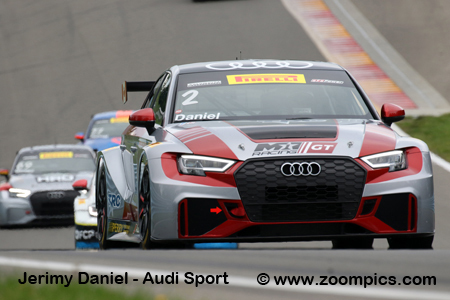 And, they returned at Watkins Glen but not before Groenke scored a third-place in the penultimate race of 2018. 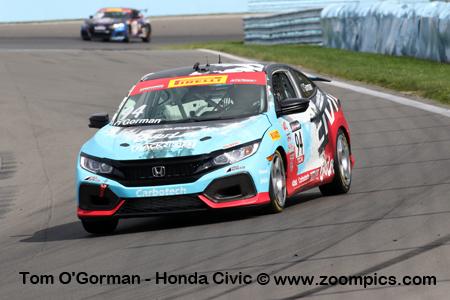 Tom O’Gorman, driving TOMO Racing Honda Civic Si, had five TCA wins in 2018 and entered the finale with a fifty-two point lead over Eric Powell. It appeared that it would be easy for O’Gorman to take the title. Unfortunately, he failed the technical inspection after race one and didn’t score any points. The following day, O’Gorman started at the back of the field and finished fourth – earning the TCA championship. 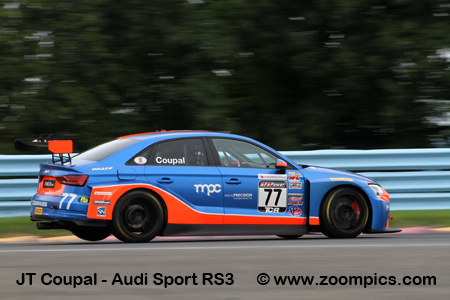 Quickest in Friday’s practice sessions was JT Coupal driving the Compass Racing prepared Audi Sport RS3 LMS. Unfortunately, Coupal was not as fast in qualifying and started behind the Hondas and Hyundais in the fifth position. Unable to maintain the pace of the Realtime and Bryan Herta entries, he finished fifth. On Sunday, the Hyundai team encounter problems and Coupal had his best result of the season – third.